12th MARCH 2018 ~ At this (young) age, I am always excited to get the chance to see old friends and will always try to meet them when they are in town. 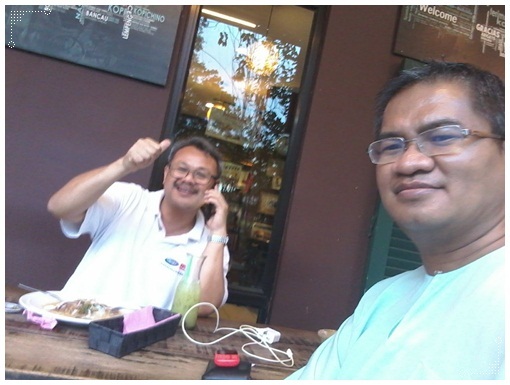 So when an ex-classmate (Budiman class of 1986) of SMS Muar announced, Mr. Abdul Razak Sapian, he would be arriving in Johor Bahru, a date was quickly set. He is now attached with UIAM Kuala Lumpur and that is a reason for the rare opportunity to connect except on Whatsapp. So we met at this restaurant called Chamek Kopitiam in Taman Universiti as that should be the most convenient venue to meet for both of us. Unfortunately it was just a short get together but I was still happy for the time and company. We definitely need a longer time to sit and chat - there are just too many things to talk about. On another note, it is high time for my classmates to hold another reunion gathering again. The last time we had one was like... I don't know - it has been too long I can't even remember. Guess someone needs to get the ball rolling.